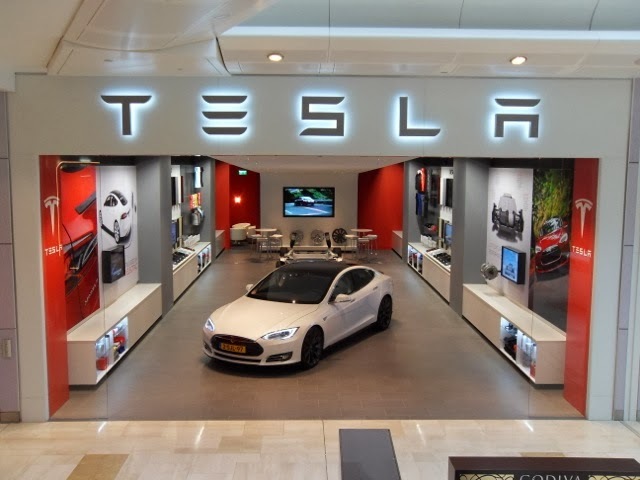 Tesla has opened its new store in London's Westfield Centre and announced that the Model S will cost £49,900 in the UK. Yes you heard right - Tesla's first presence in the UK is in a shopping centre. The company doesn't do dealerships. They say this is because every Model S is built to order, although every Lotus is built to order and Lotus has several dealers. The whole retail experience, akin to an Apple store, initially caused something of a ruckus in America. You can read more about that here. A Supercharger in Tesla's electrified view of the world is not a belt driven device to force more air into a combustion chamber but a place where you can plug in your electric Model S and charge it up for free. 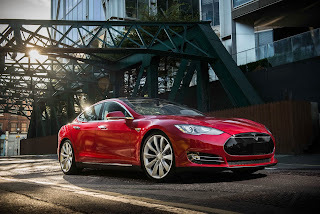 The Model S is a premium sector electric car to compete with the Jaguar XF, BMW 5-Series, Audi A6 and Mercedes E-Class. It will cost as much as a decent spec version of any of these. It has a range of 310 miles (in ideal conditions) and is the best rated car in any crash test ever in America. A few have set on fire - which bewilders fire crews because no matter how much water they throw at it the fire will continue for a few hours. The Model S is the best selling car in Norway. Worldwide it is exceeding expectations and Tesla has a similar problem to Land Rover in that it cannot make enough cars to supply demand. Land Rover's problem is a lack of 5 litre engines whilst Teslas problem is a lack of batteries. Both are counteracting these supply issues by building their own rather than buying them in from suppliers.